Gardaí said the motorcycle was found abandoned in the area but could not reveal the type of bike or whether it was used in the drive-by shooting. Garda on duty outside Connolly Train Station earlier. GARDAÍ ARE INVESTIGATING whether a motorcycle found close to the scene of the shooting in Dublin last night was used in the incident. 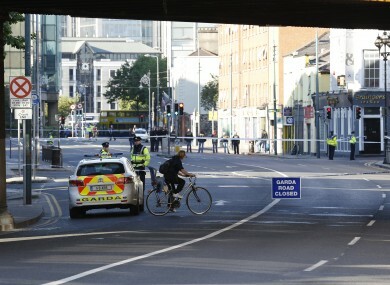 Gardaí told TheJournal.ie that the motorcycle was found abandoned in the area but could not yet reveal the type of bike or whether it was used in the drive-by shooting. The garda spokesperson added that the condition of the 33-year-old man, who was shot in the back of the head during the incident, remains the same and he is in a serious but stable condition in hospital. The victim, who is known to gardaí and has been shot previously, entered the garda station at Store Street seeking medical help at around 9.30 pm last night. He had abandoned his silver Mercedes on the path near the Red Luas Line. Ambulance crew treated him outside the station before transferring him to the Mater Hospital, where he remains. Last May, the 33-year-old was shot a number of times while sitting in his car on the Sarsfield Road in Ballyfermot. Similar to last night’s incident, he was able to drive himself to Cloverhill Prison to ask for assistance. He was then taken to Tallaght General Hospital where he was treated for injuries to his chest and arm. All roads have now been reopened and the Luas Red Line is operating as normal. Some traffic delays are being reported in the areas. Investigating gardaí have issued an appeal for witnesses to contact them on 01 666 8000, the Garda Confidential Telephone Line 1800 666 111 or any garda station. Email “Abandoned motorcycle may have been used in Dublin shooting”. Feedback on “Abandoned motorcycle may have been used in Dublin shooting”.